Without much publicity Pakistan, Nepal, Sri Lanka, Bangladesh have started processing soyameal, used as poultry and cattle feed, cutting their import dependence and affecting India’s trade to the extent that exporters see no future in the business. “Exports look bleak at the moment unless until domestic soyabean prices drop,” said D N Pathak, executive director of Indore-based Soybean Processors Association of India (SOPA). The country exported about 10.5 lakh tonnes of soyameal in the marketing year ended September 30, he said. 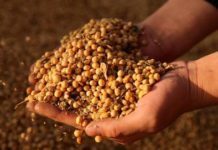 “Spot prices of soyabean, the main raw material to make soyameal, have gone up to more than Rs 3,500 per 100 kg from about Rs 3,250 in a month, according to the industry body data. Prices need to fall to about Rs 2,900 per quintal if soyameal export has to be viable,” said Mr. Pathak. High prices have made India uncompetitive against cheap supplies from Argentina and Brazil, the world’s two major producers. 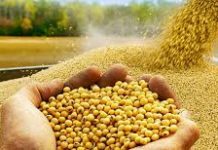 Companies in countries like Pakistan, Bangladesh are importing soybean at cheaper prices and processing at their own facilities to manufacture soyameal, Pathak said. Even direct purchase of soyameal from Argentina is cheaper than India, he said. Soymeal from Argentina is available at about $375 a tonne, inclusive of freight costs while the India-manufactured product costs about $ 500 a tonne. Prices of soybean are also being traded around the same level. The government last year increased benefits under the merchandise exports from India scheme (MEIS) to 5 per cent from 2 per cent to boost soyameal exports, though it did not help much as annual shipments declined. Under MEIS, exporters get to import goods duty-free up to the value of the benefits. The government has a limitation of increasing benefits and resultantly, exporters have not sought any intervention from the commerce ministry. However, to reduce the domestic prices of soyabean so that India again becomes competitive in international market, SOPA has sought a ban on futures trading of the commodity. In a letter to Sebi chairman U K Sinha, SOPA’s chairman Davish Jain, said last week that a few speculators have been `rigging’ future trading in soyabean for their advantage, which has made its processing unviable. 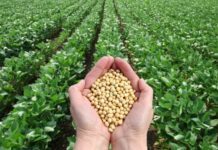 “The net effect of this speculation-driven price rise is that the soybean industry is suffering from huge disparity in crushing. More than 50 per cent soyabean crushing plants have already closed down due to this speculation- driven price manipulation by a few unscrupulous operators,” the letter said. Jain said there should be no futures trading in a commodity that is in short supply. India’s soyameal exports have dropped to 1.1 million tones in marketing year 2014-15 from a record 4.8 million tonnes in 2010-11, according to US department of agriculture (USDA) data. The USDA estimates India’s meal exports at 1.7 million tonnes this year. India exports soyameal to South East Asian countries such as Vietnam, Thailand, Indonesia besides neighbouring Bangladesh, Pakistan and Nepal.